As promised, we’ve been busy planning a surprise for Chicago this upcoming Lollapalooza weekend and it includes nine bands, two free shows, one not-free show and a lot of free beer. 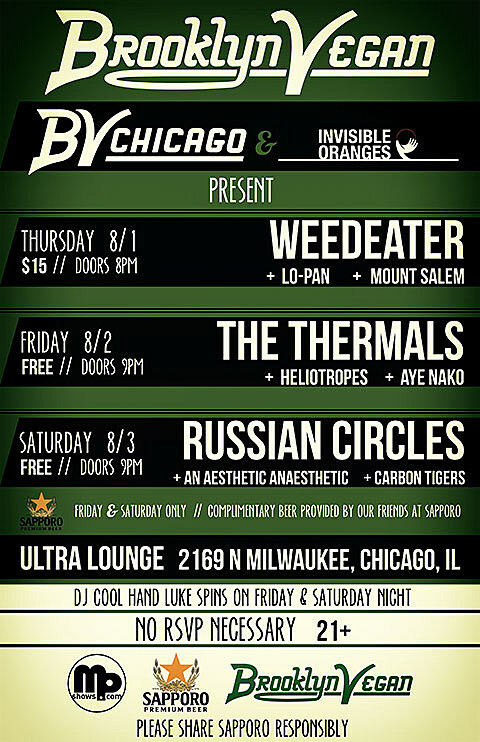 Join us at Ultra Lounge this Thursday, Friday and Saturday for headlining sets by Weedeater, The Thermals and Russian Circles. More details in the flyer above, and below…. Thursday’s show, part of a BrooklynVegan/Invisible Oranges-sponsored tour, will set you back $15 and you’re on your own for beverages, but Friday and Saturday are both free (the ticket price and the Sapporo!). The free shows are first come, first served (and 21+). No RSVP necessary. Joining us on Friday with the Thermals will be two bands both flying in just for this show from NYC. You’ll get some fuzzy indie rock courtesy of Heliotropes and get to experience the lo-fi/indie pop punk sounds of Aye Nako (who also play Black and Brown Punk Show at the end of August). Saturday we keep it completely local with opening sets by instrumental rock quartet An Aesthetic Anaesthetic and Carbon Tigers. AND DJ Cool Hand Luke will be spinning on Friday and Saturday night. Doors are at 9PM for both free shows, and Ultra Lounge is open until 3AM. See you there!